(Nanowerk News) Scientists at Rice University have created a solid-state memory technology that allows for high-density storage with a minimum incidence of computer errors. 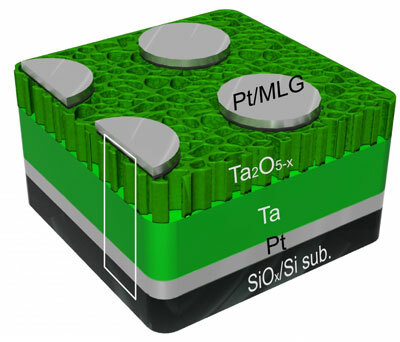 Details appear online in the American Chemical Society journal Nano Letters ("Three-Dimensional Networked Nanoporous Ta2O5–x Memory System for Ultrahigh Density Storage"). Like the Tour lab's previous discovery of silicon oxide memories, the new devices require only two electrodes per circuit, making them simpler than present-day flash memories that use three. "But this is a new way to make ultradense, nonvolatile computer memory," Tour said. Tour said Rice's new design, which requires 100 times less energy than present devices, has the potential to hit all the marks. "This tantalum memory is based on two-terminal systems, so it's all set for 3-D memory stacks," he said. "And it doesn't even need diodes or selectors, making it one of the easiest ultradense memories to construct. This will be a real competitor for the growing memory demands in high-definition video storage and server arrays." Second, the boundary's location can change based on oxygen vacancies. These are "holes" in atomic arrays where oxygen ions should exist, but don't. The voltage-controlled movement of oxygen vacancies shifts the boundary from the tantalum/tantalum oxide interface to the tantalum oxide/graphene interface. "The exchange of contact barriers causes the bipolar switching," said Gunuk Wang, lead author of the study and a former postdoctoral researcher at Rice. A structure map of a tantalum oxide-based memory developed at Rice University reveals the partially interconnected and randomly distributed internal pores in the material.